I've always used Honda SS8 (which is 10W) in K bikes and been happy with that. Wondering if anybody here uses any kind of synthetic. If so, what are the advantages? I use full synthetic, all models ATF. Don't know the weight, but been happy with it. Used non synthetic oil in my 75S forks (when I still had it) but with 15w oil instead of 7.5w or 10w oil. The transformation was great. the front end was much stiffer improving the ride no end. I hit 70kg.......II think 7.5W-10W for me. The only advantage of synthetic would be that it's less prone to foaming, so on a long rough road the suspension would retain full effectiveness for longer. OTOH, apart from the upside-downies, who's gonna suffer from that here? I change fork oil annually and even with gaiters the fork oil comes out with some dirt. With three bikes to maintain, less than $6 vs $10+ helps the maintenance budget. Even beyond the cost savings, ATF is a lot easier to find where I live, and has better viscosity control at high temperatures. Been using it since the 70's and haven't been disappointed yet. @Point-Seven-five wrote: I change fork oil annually and even with gaiters the fork oil comes out with some dirt. I feel much the same but now that both cars with auto transmissions have synthetic I might be changing over to synthetic in the forks. How much ATF would you recommend for a nice ride but good handling at speed? @MarcS wrote: How much ATF would you recommend for a nice ride but good handling at speed? It doesn't seem that blending different weights of fork oil with ATF fluid is being discussed in this thread nor is lessening the volume of fluid in the forks to affect the handling. ATF is the only fluid in Point-Seven-Five's fork tubes. The fork tubes are filled to their specified capacity with fluid of a certain weight. How well the fluid works depends upon your weight and riding style. If you don't get the handling you want then you must change to fluid of a different weight, change spacer lengths, or even change the fork springs to achieve it but the fluid volume in the fork tubes remains the same. I use ATF in my bikes because I am a heavy guy 125kg but if you are say 75kg it would be too stiff. For a 75kg guy on a standard trim K100RT/LT I would recommend using 7.5 weight at the heaviest and even 5 weight for a softer ride. On a K100/K75 the oil level will make little to no difference but on a K1100 the oil level will make a difference when that final bit of fine tuning is wanted. Thats exactly what I needed to know Rick. Thank you again. The main point is to determinate the good viscosity for it, and once you found it, stick with it. The commercial viscosity written on the bottle is often (always) very far from the real one and varies a lot between 2 brands. More; the physical viscosity varies a lot according to the temperature. The best oil would be the one which thermal stability is the best. This is known by the Viscosity index : the higher the better. About this point, ATF and Citroen LHM (and water!) are the more stable, but their physical viscosity is very low and may not fit your fork hydraulic design. 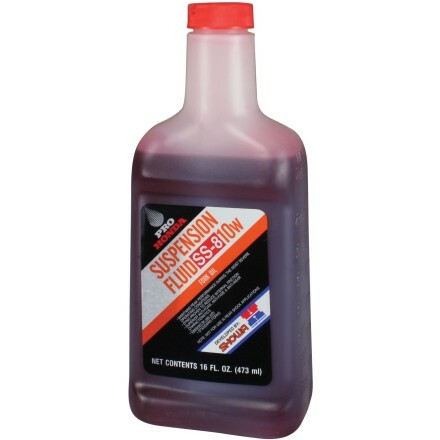 Fully synthetic oils makes possible to control this stability more easily than mineral ones. There's not an ideal and easy to find oil for a fork or a bike. It depends a lot of the way it's driven ( tourism or tourist trophy?) and the weather conditions (Alaska or Australian bush?). So you need to test and choose. Better if you limit your experimentations to a single brand with different commercial grades. And, of course, much better if you test with new hydraulics in you fork! >> Wondering if anybody here uses any kind of synthetic. If so, what are the advantages? None whatever, unless you are competeing in the IOM. @jbt wrote: The main point is to determinate the good viscosity for it, and once you found it, stick with it. Sir, yours is the first post in this thread that actually touches on the real issue. It is the viscosity of the fluid that determines damping, not fluid weight, for example, Castrol Fork 5 has nearly twice the viscosity of Belray 10W. Part of the reason threads similar to this one abound in almost all motorcycle forums is the fundamental lack of understanding of the uncoupled relationship of "weight" and viscosity. Viscosity Index is also not a truly useful measure as all it does is measure the stability of the fluid in question when subjected to temperature changes (although obviously a temperature stable fluid is an advantage). There are two measure of viscosity that are useful and potentially useful. The first is an "apples against apples" measure of fluid viscosity, this viscosity is measured in Centistokes and s normally conducted at a range of temperatures. I live in tropical Australia so the measurement of most interest to me is the one taken at 40 degrees Celcius. To illustrate what I am talking about, please see the comparison at https://transmoto.com.au/comparative-oil-weights-table/ there are other sources on the internet, but when you look at the actual viscosity of the fluids compared I will be very surprised if most people do not have a "so that's why XYZ fluid didn't work for me" moment. The second measurement is the "kinematic viscosity" which is essentially a measurement of the viscosity of the fluid in question under "stress". I've never bothered with it and include it only for technical accuracy. I agree with you 100% that determining the correct fluid (or a mixture of fluids) is a highly individual thing. In my airhead experience, most people are quite happy with Castrol fork 5 which has a viscosity just slightly higher than the obscure Milspec Aviation fluid specified by BMW. I weigh a fair bit more than most people and prefer a firmer damping action, so for years I've used a 50/50 mix of Castrol Fork 5 and Fork 10. Please note that this does not equal the now no longer available Castrol 7.5, in fact the damping is slightly heavier than that fluid used to achieve. The process of determining exactly what "mix" suits you and your riding is totally individual preference, along with perhaps some adjustment for local conditions. For example I live in a regional area of Australia and have always found from day one of BMW ownership that the somewhat "plush" action of stock forks just doesn't work very well here, other's mileage may of course vary. And, if anyone is interested that ancient Milspec fluid, well I tracked down a Shell depot in Australia who had a drum of it and as it was out of date they offered it to me for nothing. They also gave me the priceless information that the approved aviation replacement for it was Dexron II - which leads me back to the adequacy or not of ATF - if you live in a country with smooth roads and you are of slight to average build, it's probably going to be fine for you. My last comment is synthetic fluid better than mineral fluid?. In short - NO. There is more than enough anti-foaming agent and viscosity stability additives in any quality mineral fluid to allow the fluid to cope quite happily with any rational loading. Not that there is anything wrong with synthetic fluids, but if you are mixing and matching, make sure that it will mix happily with mineral fluid. I know I am starting to sound like a commercial for Castrol, but they do guarantee inter miscibility between their mineral and synthetic fluids, which is important when you can sometimes only source one or the other. I have been using Castrol fluid for 40 + years and have never had a problem with it. On the other hand, those using some other brands of fluids have had horrid outcomes. To draw on R65 experience (noting that what I am about to say is not unique to R65s), there is a large rubber bump stop at the bottom of the fork leg, people suddenly discovered that shortly after using a nameless brand of fluid (which advertised a "magic" ingredient called "seal swell") that their forks operation was greatly degraded, and in some cases were simply hydraulically locking. It turned out that the magic ingredient to seal seals was nothing more than about a tablespoon of brake fluid added to each bottle by the manufacturer - it certainly gave extended life to failing seals, but it was also, and inconveniently, fatal to rubber bump stops. Hence my decision, a long time ago, to stick to a known fluid.